This silly little segment of this week's art journal spread is a continuation of the color play I gently mentioned in "An Opening and Embrace," where creating the background was born without conscious thought on anything but color. When those colors set, I sat with them, and a figure spontaneously emerged, so I sketched it in, fast and raw, with a Derwent Inktense block. Then I saw another ... and so on, until this odd little community formed. 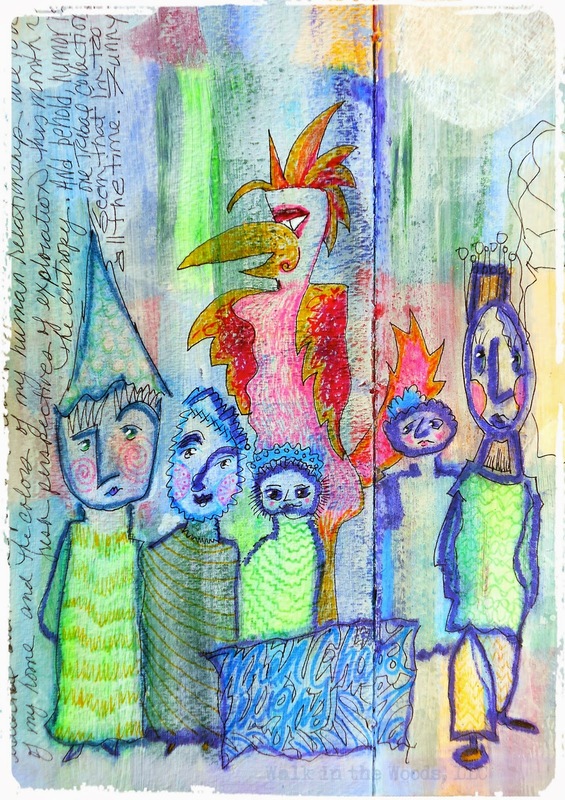 The bird creature, a fitting inspiration from Art Journal Journey, was added to the clan, along with random doodling with various pens. More words have been added since this image was captured. More words inspired by Nona Entropy. Words that offer insight into her verve, her consorts, and this path she's led me down. Or up. And I find myself trusting the Nature of Chaos more and more each day. This is new to me. Or so it seems. And I shall build on it. Wow.. I love all the little persons you found in the background...amazing! And thaks for linking to AJJ! WOW a hat a grandiose gathering of artistic and colorful creations. I love your bright colours and the characters. It's wonderful when you can let go and just let things appear in front of you. A fabulous result. A fantastic page, love your humans and your funny bird all in beautiful colors, thanks for your sweet comment on my page. Sad little army under the command of a flashy lord. Thank you all for your kind and inspiring comments. What a great little group of people, all with very distinctive personalities. I'm especially fascinated by the man on the right. I am going to imagine they are coming away from a sculpture exhibition and one of the sculptures was the big bird, because I would like it to be happy.